The Quad Pulse Package PX dust collector is designed for pharmaceutical, chemical and other processes that produce hazardous dusts in high concentrations. According to Camfil, the collector has a cleanable filter system that allows continuous manufacturing and eliminates frequent costly filter replacements. The compact unit can be positioned on the production floor and constructed to provide the highest explosion protection in accordance with ATEX standards. It can be located indoors with no need for additional explosion safety devices. 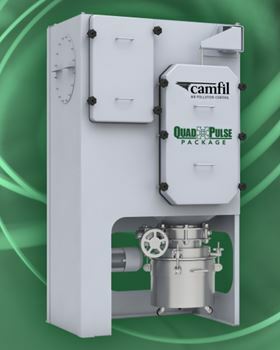 The company says that due to a segmented cleaning process performed during operation, the Quad Pulse Package only requires a single primary filter cartridge. The high efficiency primary pleated filter comes in a conductive (anti-static) nanofibre or PTFE media and is claimed to offer good dust release for extended life, energy savings and reduced change-out schedules. It also prolongs the service life of the second-stage filter, a HEPA H14 filter that provides 99.995% efficiency to capture the finest, most harmful dust particles.